Background: As adolescents spend much time on playing computer games, their mental and social effects should be considered. The present study aimed to investigate the association between playing computer games and the mental and social health among male adolescents in Iran in 2014. Materials and Methods: This is a cross-sectional study conducted on 210 adolescents selected by multi-stage random sampling. Data were collected by Goldberg and Hillier general health (28 items) and Kiez social health questionnaires. The association was tested by Pearson and Spearman correlation coefficients, one-way analysis of variance (ANOVA), and independent t-test. Computer games related factors such as the location, type, length, the adopted device, and mode of playing games were investigated. Results: Results showed that 58.9% of the subjects played games on a computer alone for 1 h at home. Results also revealed that the subjects had appropriate mental health and 83.2% had moderate social health. Results showed a poor significant association between the length of games and social health (r = −0.15, P = 0.03), the type of games and mental health (r = −0.16, P = 0.01), and the device used in playing games and social health (F = 0.95, P = 0.03). Conclusions: The findings showed that adolescents' mental and social health is negatively associated with their playing computer games. Therefore, to promote their health, educating them about the correct way of playing computer games is essential and their parents and school authorities, including nurses working at schools, should determine its relevant factors such as the type, length, and device used in playing such games. One of the most popular and attractive media among adolescents is computer games. Numerous studies show that boys play more computer games, compared to girls. , A study conducted in USA (2005) on the level of use of computer games by the Americans showed that in the houses of 75% of the subjects, the device to play computer games was found. The prevalence of adolescents playing computer games was found to be 66.4% in one of the towns in Isfahan province. Such games are vastly played, as Sharifi reported that adolescents averagely played such games 2-4 h per day. In Iran, some studies reported such games played for 1-5 h per week  or somewhat more than 6 h in a week. With regard to the impressive effects of computer games on lifestyle, these games have been named as a revolution and not just as the games to pass leisure time. This idea has attracted the researchers to this field and has resulted in two different opinions about such games. Some believe age or time of communication and consider the positive and negative functions of them similar to other games, while some other researchers explore the negative functions of computer games. Computer games have severe positive and negative effects on children. Their positive effects are innovation and imagination skills, eye-hand coordination, and a change in abstract thinking, while their negative effects include sore eyes, headache, propensity to violence, a personality change, anti-social behavior, and addiction. ,, Zamani et al. showed that normal adolescents had higher social skills, compared to those addicted to computer games. Meanwhile, among the negative effects of playing computer games at night, the probability of depression has been reported. Adolescents and teenagers, who are the valuable wealth of the society and the human resources to make future, undergo numerous physical and mental changes, due to which constant evaluation of physical, psychological, mental, emotional, and social health is of great importance in health provision service. In addition, paying close attention to the health of this specific age group, especially during school years, from aspects including the critical role of their health in their academic performance, promotion of the personal and social abilities, and ultimately, having a healthy soul and body in their future life is inevitable. Adolescent period is the most critical period in the formation of personality and adaptation. According to the latest census conducted in 2011, adolescents account for 15% of the total population in Iran. Therefore, evaluation of the effects of their usual and current behavior on their health is essential. Although research in this field is not older than 20 years, prevalence and popularity of computer games is notable among Iranian adolescents in recent years. This issue has been concurrently accompanied by their contact with other factors that are effective on their health, such as internet and application of other mass media. Therefore, in the current socio-cultural background, playing computer games may be associated with socio-mental health and needs research. The present study aimed to find the association between playing computer games and the mental and social health among male adolescents in Iran in 2014. This is a cross-sectional study. The study population comprised all 13-14-year-old adolescents studying in governmental high schools of Isfahan. Inclusion criterion was lack of any physical or mental disease. Multi-stage random sampling was conducted. Firstly, the list of all boys high schools in six educational districts was prepared. Then, through random cluster sampling, six boys high schools were selected (one from each district). Next, through distributional sampling (with regard to the number of adolescents in each school), 210 students were selected by test power of 80% (z = 0.84) and keeping possible dropouts into consideration. Relevant permissions were taken from the ethical considerations committee. There was no obligation to attend the study. The parents were called to give their consent for their children's attendance in the study. To collect the data, Goldberg general health questionnaire (GHQ)  and Kiez social health questionnaire  were adopted. Demographic characteristics and computer games associated factors such as the length of games, type of games, type of device, and location and mode of playing games were also investigated. The GHQ, designed by Goldberg and Hillier (1979), was adopted to investigate subjects' general health status with the goal of distinguishing healthy individuals from the diseased ones. This questionnaire investigates the domains that are somehow influenced by computer games. This questionnaire consists of four subscales with seven questions. The questions of each subscale are arranged sequentially. These dimensions include physical signs, anxiety and insomnia, social dysfunction, and depression. All items of GHQ have four choices. The items were scored by Likert's method. Total score of each subject ranged 0-84. Lower scores show better mental health. The questionnaire is valid (0.93) and its reliability is moderate (0.87). Up to now, over 70 studies have been conducted on its validity all over the world. For instance, Danesh reported its validity as 0.91 through test re-test method. Adolescents' social health was evaluated through Kiez social health questionnaire that contains 20 items on five components of social prosperity, social unity, social cohesion, social acceptance, and social participation. This questionnaire was scored based on a five-point Likert's scale, with total score of 100. Higher scores show better social health. Scores 20-46 show poor social health, 47-74 show moderate social health, and 75-100 show appropriate social health. The questionnaire is valid (0.83) and the validity of its subscales of cohesion, acceptance, participation, social prosperity, and unity was calculated by Chronbach alpha values of 0.75, 0.85, 0.83, 0.75, and 0.79, respectively. Conditions of playing games included length of games (once or twice a week, and 1 h, 2 h, 3 h, 4 h, or more in a day); type of games which was categorized by Mehrabifar et al. in seven categories of events, combat, educational, sports, simulations, internet, and mystery; type of device used for playing games (computer, mobile, tablet, and play station); location of playing games (home, a coffee net, or a game net); and mode of playing games (single, two partners, and group). Questionnaires were filled by the students at school during their recess time with coordination of the school principal. Data were analyzed by Pearson and Spearman correlation coefficients, one-way analysis of variance (ANOVA), and independent t-test in SPSS20. Results showed that most of the subjects' fathers and mothers were self-employed and homemakers, respectively. Subjects' parents' education was mostly high school diploma. Mean (SD) of subjects' previous year average was 18.40 (1.47), and mean (SD) of their family members' number was 4.22 (0.9). Most of the subjects played computer games (96.7%) mostly at home and 1 h in a day. Most of the subjects played games alone on a computer (58.9%). Among the types of games (events, combat, educational, sports, simulation, internet, and mystery), the subjects' preferences were sports (48.1%), combat (29.9%), events (6.1%), internet (5.1%), simulations (4.2%), educational (4.1%), and mystery (0.5%), in this order. With regard to mean scores of mental health domains, the highest mean (SD) was for social dysfunction [9.97 (3.6)] and the lowest was for depression [3.32 (3.3)]. Mean (SD) of overall score was 22.15 (9.66). Among the domains of social health, social unity had the lowest mean (SD) [8.28 (2.67)] and social participation had the highest mean (SD) [17.52 (4.3)]. The overall score obtained for social health was 62.93 (9.5). Subjects' social health status was graded as poor (4.7%), moderate (83.2%), and appropriate (12.1%), which shows that most of the subjects had moderate social health. Pearson test showed no significant association between the length of games and subjects' mental health. Meanwhile, it showed a significant inverse association with the score of social health [Table 1], which was more in the domain of social unity. Spearman test showed a poor significant inverse association between events games and mental health scores (r = −0.16, P = 0.01) in the domains of physical condition, anxiety, and depression [Table 2]. There was no association between the type of game and social health. One-way ANOVA showed no significant association between the device used for playing games and the mental health score, although a significant inverse association was observed between the type of device (tablet) and mental health [Table 3]. Spearman test showed no significant association between the mode of game and mental health (P = 0.51) and social health (P = 0.33). Independent t-test showed no significant association between the location of playing games and mental health score (P = 0.49) and social health score (P = 0.27). This study aimed to investigate the association of conditions of playing computer games and the mental and social health with a limited sample size. The findings showed that most of the subjects played games alone on a computer at home for 1 h a day, and sports, combat, and events games were among their priorities, respectively. With regard to mental health and its domains, the dimensions of social dysfunction and depression had the highest and the lowest means, respectively. With regard to the obtained results, as the cutoff point score in GHQ was considered 23, based on Nourbala et al. (2008), it can be concluded that the subjects had relatively appropriate mental health. Amini reported the subjects' mean score of mental health (using similar GHQ) as 48.29. The difference in subjects' mental health in these two studies could have resulted from the difference in subjects' age and geographical locations. 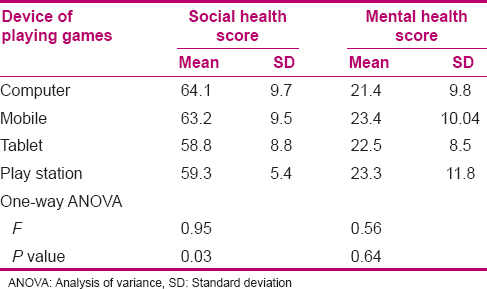 With regard to social health and its domains, the dimensions of social participation and unity had the highest and the lowest scores, respectively. Subjects' overall social health was observed as moderate, which needs improvement. In the study of Ganji et al.,  Kiez social health questionnaire was adopted. Comparison of social health components in their study and in the present study showed that subjects' mental health had a better condition in their study, possibly due to the age difference (with regard to the critical age of adolescence period that overlaps transition from childhood to adulthood) and the gender of the subjects (as girls generally have a better mental health, compared to boys). With regard to the association between subjects' mental and social health and the length of playing computer games, there was an inverse significant association between the length of playing games and social health. In fact, the more is the time spent on such games, the less social communications the adolescents make with their family members and relatives, and consequently, more are the negative effects on their social health. Previous research in this field showed the effect of length of games on their users, including the study of Saffarian et al., conducted in Golestan province, Iran, on the association between use of computer games and adolescents' mental health and educational function and reported a significant association between the length of games and subjects' mental health and educational function. Hellstrom et al. also showed an association between the length of games and negative outcomes in 13-18-year-old subjects in Sweden. In can be generally concluded that the length of modern communicational technologies (internet, computer games, and satellite programs) is associated with adolescents' social training including adaptation. In fact, the more is the time the users of new communicational technologies spend on these issues including computer games, the lesser time they dedicate for making communication with others and they somehow get socially isolated. Their overall health including mental and social health is threatened. Previous studies investigated and reported the effect of length of games on mental health, but no study was conducted on social health and computer games. The present study showed that the length of games affected social health, although its sample size was limited. Further studies are suggested to be conducted with a larger sample size. With regard to the type of computer games and subjects' mental and social health, there was an inverse association between events games and mental health, which was significant for the domains of mental health (physical condition, anxiety, and depression). As events games was among the first three priorities of the subjects and its association with mental health was revealed, importance of parents' supervision on adolescents' selection of games is felt. Mehrabifar et al. and Saffarian et al. showed a significant association between computer games and adolescents' function and academic performance, which is in line with the finding of the present study. Various studies showed that, with respect to psychological health, computer games result in aggression, computer addiction, depression, isolation, and anxiety, which is consistent with the finding of the present study. With regard to the association between the selected device to play games and the mental and social health, a significant association was observed between the device and social health (between using a tablet and social health). It can be argued that the more portable the device is, the more conveniently the user can carry that and the more time is consumed on it leading to less communication with others, negatively affecting the users' social health. Few studies have been conducted in this field. Sharifi et al. reported that there was a significant association between absence or presence of computer games and subjects' studying. It can be concluded that the more the users play computer games, the less time they spend on making communications with others and doing their own duties. With regard to the mode of playing games (single, paired, group) and adolescents' mental and social health, no significant association was observed. Farmanbar et al. investigated the association between playing computer games and aggression among guidance school students in Rasht, Iran. Their results showed no significant difference in aggression between two groups (with and without parents' partnership), while with regard to physical aggression, there was a significant difference between two groups(with and without peers' partnership) as the aggression was more in the group with peers' partnership. The existing difference between the results of their study and those of present study can be due to the number and gender of the subjects, and the fact that although aggression is an effective element in mental health, in the present study, overall mental health was investigated. There was no significant association between the location of playing games and subjects' mental and social health. Doran et al. showed an inverse association between location and attendance of others in the location of playing games, and social skills. In fact, selection of home to play games and more history of playing games lessened the social skills. The difference between the findings of their study and those of the present study may be attributed to progression of existing devices and technologies, and the fact that nowadays, there is no limitation in playing such games in specific locations. The present study revealed a significant association between adolescents' mental and social health (P = 0.001). In fact, mental health and social health have interactional effects on each other, and consequently, empowerment of one has a positive effect on the other leading to adolescents' overall health. The limitation of the present study was that it just showed the correlation, while a disorder in health may lead to increased use of such games. Therefore, our obtained results do not show a one-way association between computer games and social and mental health. Generally, it can be noted that the type, nature, consumed time on the computer games, and to some extent, the type of device concerning its portability and convenience of use most of the times may be associated with their users' mental and social health and the relevant technologies. However, further research is needed in this field. With regard to the obtained results, it can be concluded that playing computer games can be an effective factor on users. The present study showed inappropriate effect of computer on users' mental and social health. Further research with a higher sample size is needed to investigate other aspects of this issue. Generally, it should be noted that there is a poor correlation between playing computer games and adolescents' mental and social health, which reveals the need for more precise supervision and education of correct way of playing such games by the parents and the nurses working in schools, with regard to the type and length and the device used in playing such games. Further studies with a larger sample size are needed to investigate other aspects of playing such games. This article was derived from the master thesis of Mehrnoosh Mohammadi with project number 393499, Isfahan University of Medical Sciences, Isfahan, Iran. The Health Deputy of Isfahan province, the General Directorate of Education of the province, and the Department of Education of the six districts of Isfahan are acknowledged. Faculty of Nursing and Midwifery, Isfahan University of Medical Sciences, Isfahan, Iran. Doran B, Azad FP, Fathi AA, Poorhossain R. The role of computer games in the formation of youth identity. J Behave Science 2012;6:299-306. Kasiri DN, Eslami A, Mostafavi F, Hassanzade A, Moradi A. The relationship between computer games and quality of life in Adolescents Aging 12-15 in the city of Borkhar, Iran. Health Research 2011;7:291-300. Amini K, Amini A, Pharm D, Yaghobi M, Amini D. High school students playing computer games. Developmental Pscychology 2007;4:189-98. Mehrabifar F, Mortazavi M, Lesani M. Reviewing the type of computer games and the time spent on them and their relationship with the student′s educational achievement in Kerman′s high schools. Research curriculum Planning 2012;9:125-35. Sharifi L, Shaghaghi M, Sharifi S. Relationship between computer games and the study of secondary school students in Karaj. J Academic Lib 2001;45:111-30. Abdolkhaleghi M, Davachi A, Sahbaie F, Mahmoudifar M. Surveying the association between computer video games and Aggression in male students of guidance schools in Tehran, 2003. J Azad Univ Med Sci 2004;15:141-5. Allahverdipour H, Bazargan M, Farhadinasab A, Moeini B. Correlates of video games playing among adolescents in an Islamic country. BMC Public Health 2010;10:286. Khodabakhsh S, Maher F. Compare ways of coping with stress in adolescents dependent and non-dependent on computer games. J Family Research 2008;2:51-74. Chiu S, Lee J, Huang D. Video game addiction in children and teenagers in Taiwan. Cyberpsychology Behav 2004;7:571-81. Lateh H, Muniandy V. Technology integrated teaching in Malaysian schools: GIS, a SWOT analysis. J Educational Tech 2011;3:64-74. Wan CS, Chion WB. Psychological motives and online games addiction: A test of flow theory and humanistic needs theory for Taiwanese adolescents. Cyberpsychology Behav 2006;1:317-24. Zamani E, Kheradmand A, Cheshmi M, Abedi A, Hedayati N. Comparing the social skills of students addicted to computer games with normal students. Addict Health 2010;2:59-65. Lemola S, Brand S, Vogler N, Perkinson-Gloor N, Allemand M, Grob A. Habitual computer game playing at night is related to depressive symptoms. Pers Individ Dif 2011;51:112-22. Mahmoudifar U, Khezr TZ, Rezvani P, Salehi K. The place and role of nurses in school health. Journal of Scientific Research in the Field of Quality Policy and Health Management 2009;33:27-31. Ganji K, Navabakhsh M, Zabihi R. Relationship between identity styles and social well-being with help-seeking behavior of high school students in mathematic subject. J Q Educate Psychol 2012;7:95-123. Taghavi SM. The normalization of general health questionnaire for Shiraz university students. Daneshvar Raftar 2008;15:1-12. Taghavi SM. An investigation validity and credibility of the general health questionnaire. J Psychol 2001;20:381-98. Danesh E. A comparison of happiness, physical and mental health in male and female student′s married and single of university. J Appl Psychol 2011;4:56-71. Amini ZM. Investigating the relationship between metacognition beliefs with mental health and academic achievement in male students of the city of Oshnavieh. Journal of Educational Innovations 2007;6:141-54. Ganji H. Social development. In: Mirhashemi M, editor. Developmental Psychology, 2 nd ed. Tehran: Besat; 1997. p. 197. Saffarian S, Abdollahi M, Daeizade H, Bayat A. The relationship between the amount of playing computer games and student′s mental health and Academic performance. Journal Information and Communication Technology in Educational Sciences 2013;3:5-20. Hellstrom C, Nilsson KW, Leppert J, Aslund C. Influences of motives to play and time spend gaming on the negative consequences of adolescent online computer gaming. Comput Human Behav 2012;28:1379-87. Ahmadi P, Khademi E, Fatahi BS. Effects of new communication technologies (Internet, computer games, satellite) on social education, with an emphasis on the compatibility of the second year high school students in Tehran. New thoughts on education-faculty of education and psychology Al-Zahra university 2009;5:9-36. Farmanbar R, Tavana Z, Estebsari F, Atrcar RZ. The relationship between playing computer games with Aggression among middle school students in the city of Rasht in 2013. Health Education and Health Promotion 2013;1:57-66. Doran B, Azad Falah P, Ejei J. Relationship between computer games and social skills of adolescents. J Psychol 2002;6:4-17.